Traveling to other countries can be challenging at times. Learning a few things about the rules and customs of Italy before you go can help a lot. Here are ten hints that can help you enjoy your trip. Debbie waiting for a train with our luggage. 1. This one bears repeating: always validate your train tickets BEFORE boarding your train. Unless you have a reserved seat ticket printed from your printer, or a saved one on your cell phone. 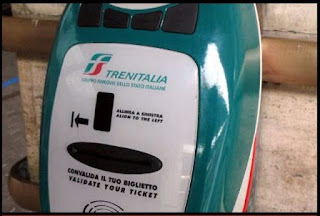 You are liable to pay a very stiff fine of 50 euros and possibly be removed from the train at the next stop! Train ticket validation machine as found on train station platforms. 2. Always validate your bus tickets on the bus when you board. If you don't, you might face the same fine as above of 50 euros! A couple we were traveling with in Florence were escorted to a bank to withdraw 100 euros to pay their fine on the spot! For the whole story, please see the post "Our Bus Ticket Fiasco in Florence" below. 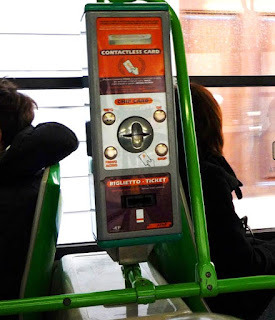 Bus ticket validation machine as found on a city bus. 3. At restaurants, there is almost always a “pane e coperto” which literally means “ bread and tableware”. Sometimes, it just says, “coperto.” This is a basically service/cover charge that is included on the check for each guest. It can usually be found on the menu. The amount usually ranges from €1,50 to €2,50 each. You should always receive an itemized bill for your meal, drinks, coperto and servizio (service charge, if there is one). Look for "servizio" and "coperto" on the menu first so you won't be surprised when you get your check. Sample menu and check with "pane e coperto" charges. 4. When asked in a restaurant if you would like water with your meal, it is usually referring to bottled water that you pay for – either "acqua naturale" (still or plain) or aqua "frizzante" or "gassata" (with bubbles). Most Italians prefer bottled water for the taste even though their tap water is perfectly safe to drink. We often drank tap water in our self-catering apartment rentals. 5. When staying in a hotel in Italy, your key card might also be used to activate the lights in your room. This is touted as a power saving idea. So, when you enter your room you need to slide your key card into the slot on the reader and leave it there to have power. When you leave, take your key card with you. This could be a problem if you’re hoping to charge a laptop while your gone, but if you have two cards, you could leave one in the reader if you’re comfortable with that. Or, I've seen online that you could try to inserting a business card to see if that works…we didn’t try that yet. 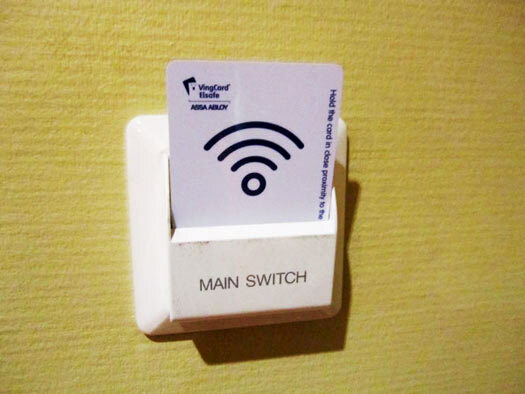 Typical key card electrical activator in a hotel room. 6. In Italian restaurants, don’t expect nice Italian bread with olive oil and balsamic vinegar for dipping that you might find in restaurants at home. This is not an Italian thing. Bread may be served but generally it is for cleaning up any leftover sauce on your plate by “fare la scarpetta” ("to make a little shoe") to sop up the sauce. 7. You have to ask for the check, “il conto, per favore” (the total/bill , please). Don’t say “il canto” ("the singing") like I did – the waiter broke out into song! 8. 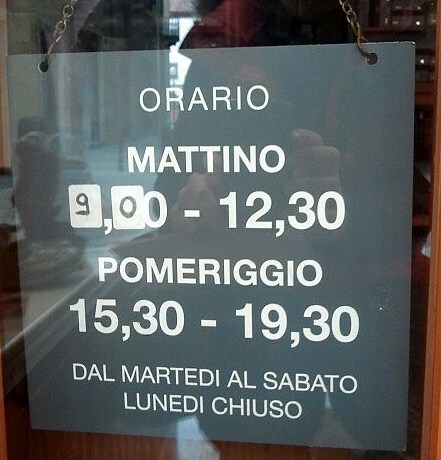 Try to speak a bit of Italian. It will be appreciated. Especially, say, “Per favore” ("please") with each question, request or order. Also, remember "Prego," which means "you're welcome," among other things. 9. 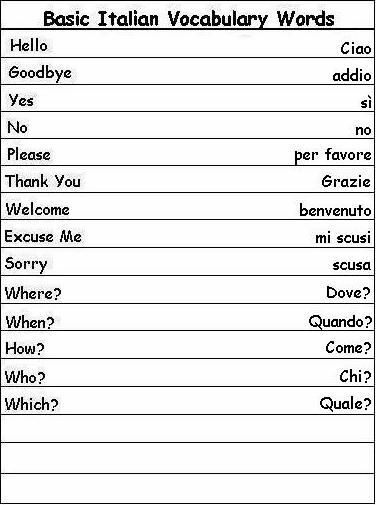 As mentioned above, it is great to learn some important phrases and words in Italian for your stay. It is Italy, after all.While many people speak English, it is nice to start a conversation with, “Buongiorno, Buona sera or Buona serata” ("good morning, good afternoon or good evening"). Having Google Translate on your iPhone can be a big help. 10. 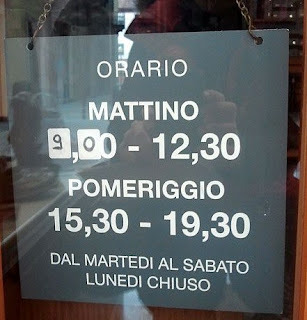 Be aware that many shops close between 1:00 and 4:00 in the afternoon for lunch.